Picked the last of the lettuce today. The lettuce, radish and green onion will make a salad topped with strawberry poppy-seed salad dressing. Sweet local strawberries make the bright pink dressing. Today’s harvest: kale, mustard, lettuce, peas, green onions, radish. Fresh, red ripe local berries make this dressing bright pink. It looks like food coloring is added. There is no onion, usually found in poppy-seed dressing. Combine all the ingredients except poppy seeds and blend till pureed and emulsified. Stir in poppy seeds. Zucchini plants are loaded with golden blossoms. Zucchini Everything is my collection of zucchini recipes. Zucchini is on the way. 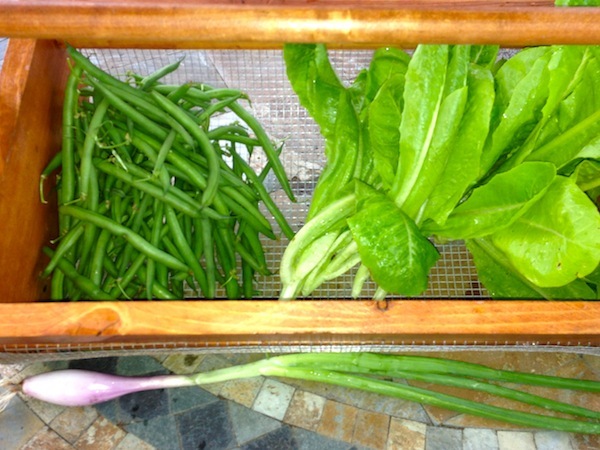 Sugar snap peas, pak choi, turnips, lettuce, radish, green onions. Salads and stir-frys are the blue plate specials at our house this week. The little white turnips in the corner of the basket may change your mind about turnips. These Japanese Baby Turnips, “Mikado” are from Renee’s Garden I grow them in the spring and in the fall. These white, mild turnips grow as big as walnuts. They are good raw or cooked with the greens. I met Renee Shepherd at my first Annual GWA Symposium*. I admit to being a little star struck meeting Renee of Renee’s Gardens. “You’re Renee! Of Renee’s Gardens! I recognized you because you look just like your picture,” I said. She was kind enough not to say anything. Then, I quickly left, praying that Renee had not read my name tag. Spring greens, spinach, strawberries with balsamic dressing. I always order way too much seed for the spring salad bowl. 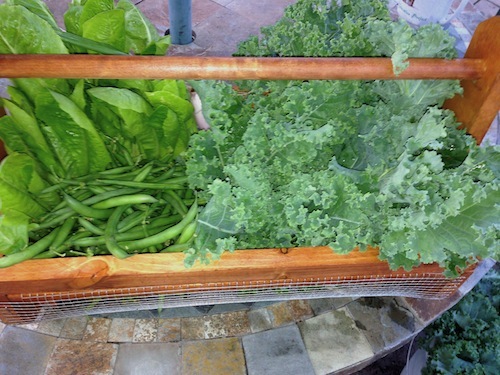 Lettuces, arugula, radishes, scallions, and spinach come up by the crisper full. I love salads. Plus, I like those generous seed packets that have enough seeds for succession planting all season. I will always plant more lettuces and radishes every single week of the spring until it just gets too hot. Thin small lettuces to allow room for the others to grow. I can never have too many spring greens, baby leaf lettuces, chopped salad, wilted lettuce. Top with chive blossoms or lacy chervil leaves. Serve with the lightest of dressings. Renee’s Garden Seeds has a big gourmet greens selection. The only problem will be limiting your salad selections to the size of your garden. I like Renee’s combo selections because the seed combination’s are a thrifty way to get a lot of variety into a small garden. Container lettuce, “Ruby & Emerald Duet” is a perfect pairing of emerald-green baby butterhead rosettes with red and crispy mini leaf lettuce. The “Caesar Duo” romaine lettuce combo of red and green baby size lettuces. These Romaines are the foundation of the best homemade Caesar salads you’ll ever make. Romaines also grow to crispy, crunchy leaves, perfect on sandwiches. The “cut and come again” mescluns are a jumble of color, size and texture in containers or hanging baskets. Lettuces, radish and green onions will be gone before you need the baskets and containers for their warm weather annuals. Last spring I tried the “Paris Market Mesclun”, a mix of several baby lettuces, chicory, endive, and arugula. Small successive plantings stretched the flavors, textures and colors of this “cut and come again” mix through the whole spring. Yes, there is a real Renee. And yes, she selects, grows and eats this stuff before she offers it to us in her beautiful online only catalog. Plus, the website tells how to plant, grow, harvest, prepare and cook all these amazing vegetables. Renee’s Garden Sowing in seed-starting containers to transplant into your garden will get you headed in the right direction. Renee’s Garden Seeds offered seed to garden writers. It’s a great way to grow and share information about what’s new for home gardeners. 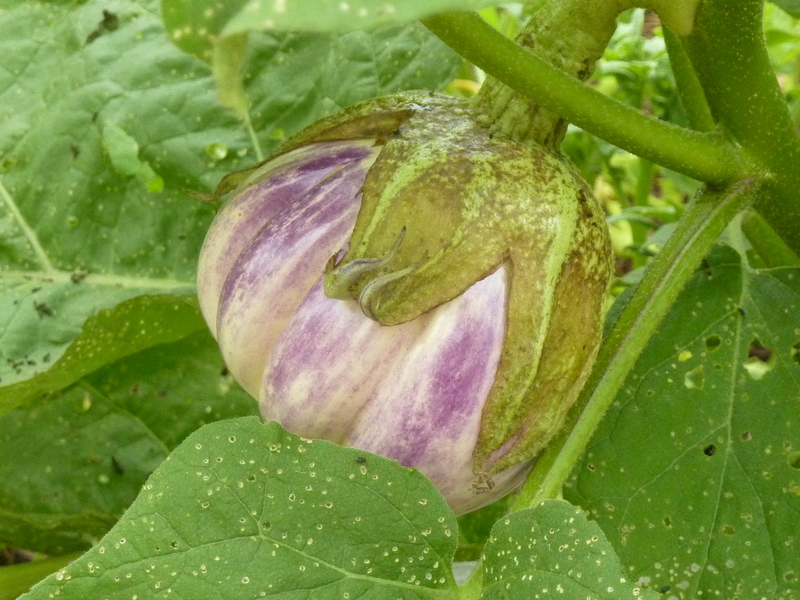 For example, I grew “Little Prince” a container eggplant. I was smitten. It was beautiful. The lavender blooms alone would be reason enough to grow Little Prince. Being a garden writer and blogger is great fun because I get to share the joy and pleasure of gardening with others. Small and tender, marinade little eggplant halves and quarters then, grill. Serve as a warm side or add other grilled vegetables for a cold marinated vegetable salad. It is surprising to find salad greens and kale that are not bitter in mid June. It’s been a beautiful early summer with plenty of rain and sunshine. So, my guess is that the lettuce and the kale are still tender because they are growing fast and picked as soon as they are mature. A few days later, the lettuce still in the garden bolted and was very bitter. Little kale leaves went into the salad bowl. Larger leaves were sautéed with garlic and cooked in a pasta dish with sweet red onions. Since kale is a super food loaded with nutrients. The next seeds of kale will be planted for fall harvest. Harris Seed sent 5 seed packets of my choice for trial. I’ve never grown their product, so I thought I would give it a trial. There will be a full report on all 5 varieties at the end of the season. But these two vegetables are doing exceedingly well. I just couldn’t wait to tell you because you still have time to get in a crop of beans and a fall batch of this Romaine lettuce. Leaf lettuce is my favorite, but if a Romaine can change my mind, Kruger may be the one. All other lettuce is gone for the season. As we jump into full fledged summer, my juicy leaf lettuces have gone on to bolt, bloom and produce seed. The only lettuce still growing bitter-free is the Kruger. Get this: Kruger has just started to bolt – a week or 2 later that all the other lettuce. It is not bitter. I sat there like a rabbit in the garden, taste testing a leaf from a few different bunches of this cos lettuce. Kruger Romaine is beautifully formed and nearly every leaf is edible. It stands tall but tender. There has been a minimum of insect problems and no disease. 75 Days. Kruger Romaine lettuce is an improved Parris Island Cos type that offers growers’ resistance to Corky Rot. The heavy, tall, upright heads of Kruger produce crisp green outer leaves that are slightly puckered. The hearts are creamy yellow and have a very tender and sweet flavor. When harvesting Kruger lettuce, there is very little waste, which leads to more useable product and higher returns per acre. 53 Days. Lewis green bean produces early, big yields of 3-4 sieve beans, on upright plants that offer a high pod placement for easy mechanical or hand harvest. 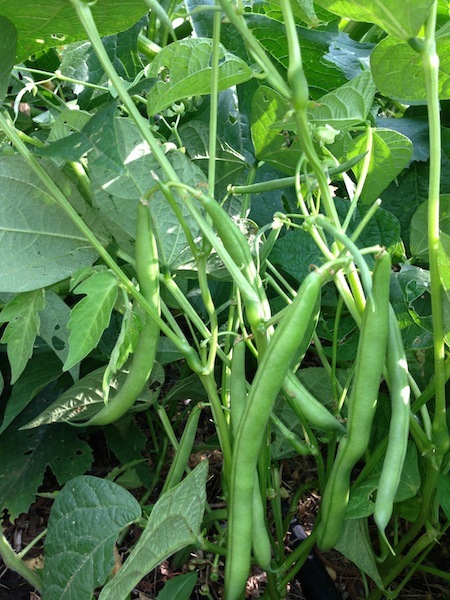 The attractive medium-dark green, round beans are 5.5″ in length, straight, smooth and have slow seed development. Lewis green beans have an excellent eating quality and an excellent disease package that includes resistance to BCMV-1 (US 1), Beet Curly Top Virus, Halo Blight and Rust along with intermediate resistance to Bacterial Brown Spot. Patent Pending. This beautiful almost blue and very frilly kale is from Botanical Interests. We’ve been picking as needed, but with the launch of summer, I harvested it all today. The smaller leaves will be part of a fresh spinach salad. The biggest leaves will be chopped, blanched, frozen. Sometime later it will be used in a pasta and sausage dish, qiiche or, potato soup recipe. I have more seed in the packet. It will be sown in late summer for a fall crop. The kale that gets a touched by frost is sweeter. The ideal method of growing kale is to plant an early spring crop, use the garden space for a summer crop, like bush beans, and sow kale again in August or September. I have raised beds and high hopes for Southeast Missouri garden, zone 6A. We are still a couple of weeks away from the juicy giant tomato of my dreams. “Do you want a tomato sandwich?” I yelled out the back door last summer. “Tomato sandwich? You mean without the Bacon?” Jules replied. This was an un paralleled act of generosity on my part. I was offering to share the first big red, ripe tomato of the summer. Jules won’t come in for a lunch-time tomato sandwich. He will come in for a Bacon, lettuce and tomato sandwich. Let’s share our tomato favorites throughout the season. Leave a comment, please. I have a new raised bed that is 4 ft square and I plan to see just how much I can produce in this small space. My point is that we can have fresh home-grown produce in the space of an apartment balcony, or a suburban front porch. I’m growing great tomatoes in a 5 gallon bucket. Plus, there is room to tuck in a basil plant, some thyme or, some chives. 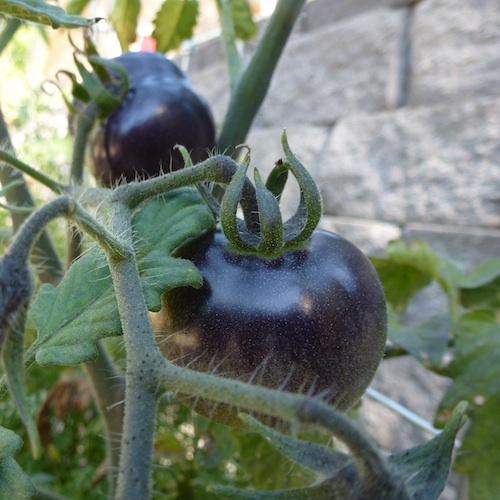 I am also growing a brand new tomato, Indigo Blue. It is a saladette tomato, meaning bigger than a cherry tomato but smaller than a Celebrity. Saladette is a GIANT Cherry or a really small beefsteak. Posted in Herbs in the garden, Herbs in the kitchen, My Gardens, My Homeplace, Oh Grow Up! Patio planters are filled with salad greens and pansies. 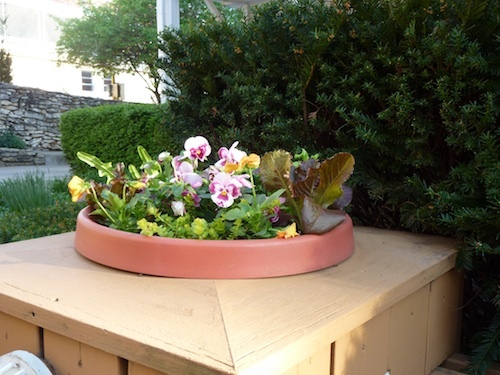 Expand your ideas about container gardens and planters. 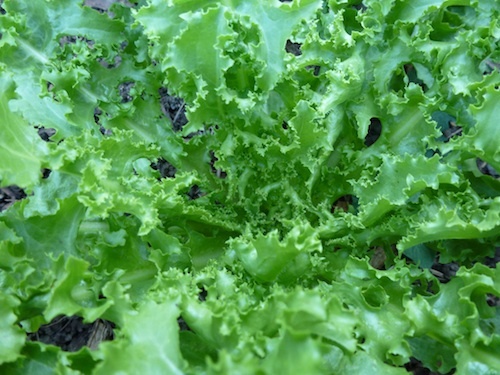 Grow leafy salad greens in full sun in spring and partial shade or shaded location in summer. I love the idea. Everything in this planter is edible. 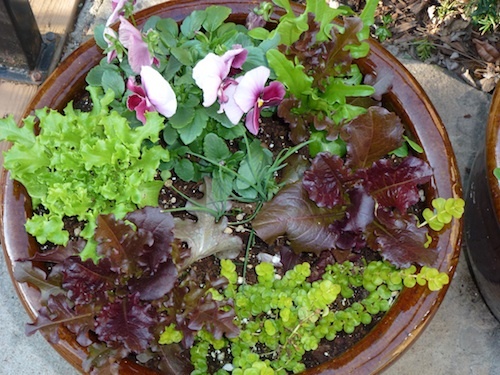 The mix of pansies and lettuce are a great idea. These flowers belong to the Inn Keepers at Southmoreland on the Plaza – an Urban Inn in Kansas City MO. frillly loose leaf lettuce can fill a container with color and texture. It gave me the idea to add the beautiful textures and shapes of lettuce into my planter and hanging baskets. I know you’ve seen lush baskets of ornamental sweet potatoes. Sometimes by the end of summer, most containers have a few blank spaces. Toss a little red lettuce or beautifully textured arugula in the container. Grow late season crops tucked in anywhere. Put a few seeds in an empty garden row or an unused container. Fall is a good time for second season or cool season crops. Once an ashtray, this patio furniture is now a mini container garden. The bonus is you get a home grown salad. Some lettuces and radishes can take a light frost. The soil is already warmed by the summer sun and crops will germinate quickly. Keep soil moist to encourage germination. Share your combination planters with us. Leave a comment below. Garden Bloggers Bloom Day shows off all the blooms in my garden on August 15 2011. Even more than blooming, this month is about what happens after the bloom. The produce, fruit or seed that is created after the flower. I am trying to stay ahead of the of the zucchini production by picking them small, like the two little ones on the right. The blossoms are still attached to these Clairimore variety. The bigger ones became chocolate zucchini cake or zucchini and black walnut cake with lemon glaze. This year, is not a good year for my garden. I couldn’t water enough to keep up hardy production. The garden plants are stressed and more suseptible to insects and disease. 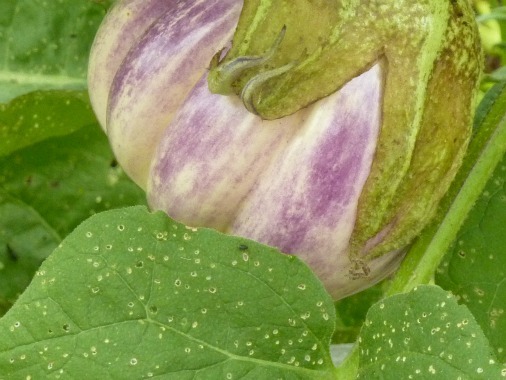 Flea beetles are eating up the plants faster than the plants can produce eggplants. I only got in a couple of pickings of green beans before a gang of bug thugs moved in and trashed the bean patch. Flea beetle damage. The little tiny holes in leaves and roots. green beans) And a couple more cucumbers and squash to replace the ones killed by insects. It’s just a gamble to see if they produce before a killing frost. The space was empty and I had extra seed. We shall see. Tomato plants did not set blooms because it was so hot. So, I will have a smaller than anticipated harvest. I’ll make some tabouli and a batch of gazpacho. Plus, I have enough to share with neighbors. I won’t have enough to can or put up as salsa. But I did have enough for a couple of taste testings with the nine different varieties of heirloom tomatoes. I’ll eventually review them all in my HubPages. There is a lot of good tomato information. Next year, I’ll grow a few of the best tomatoes from this summer. 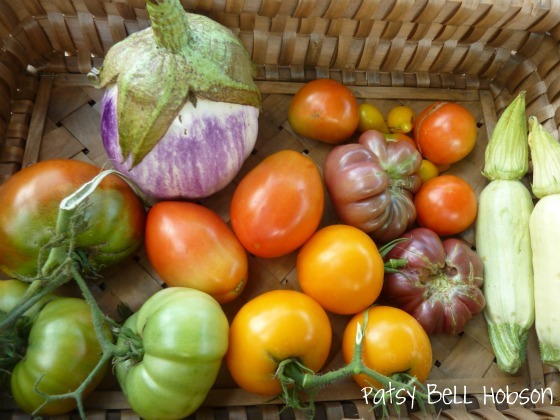 And, I’ll grow some heirlooms I’ve never tried before. 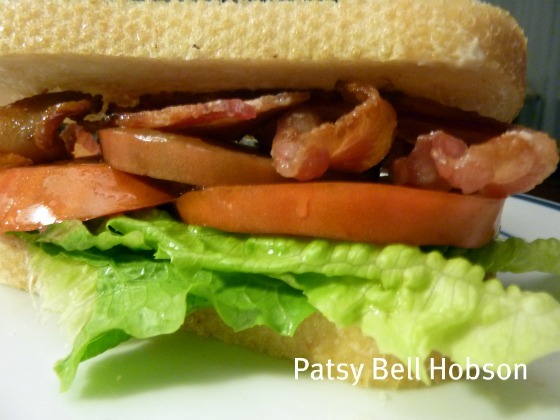 Sourdough bread, crisp lettuce, oven baked thick sliced bacon. 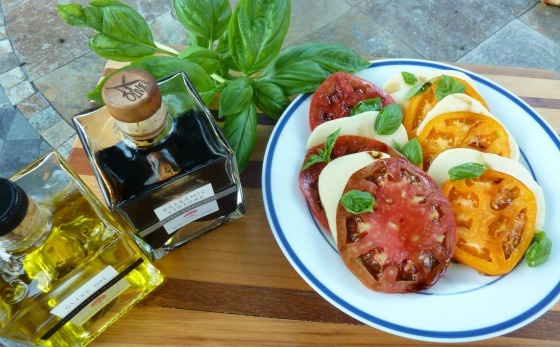 Heirloom tomatoes, mozzerella cheese, balsamic vinegar, olive oil.